Get festive this summer holiday by making any of these star-studded desserts for your friends and family! Simple to make and delicious to eat, these tasty treats are sure to add an extra sparkle to this fire-cracking holiday. 1. Melt 12 ounces of white chocolate chips in a microwave according to the package directions (make sure that strawberries are completely dry; even a little moisture will alter the texture of the candy). 2. One at a time, dip strawberries into the chocolate and then into blue sugar or edible glitter. 3. Set them to harden on waxed paper. 1. First, skewer mini ice cream sandwiches on popsicle sticks. 2. Then, press the exposed filing into a plate of sprinkles or nonpareils. 3. 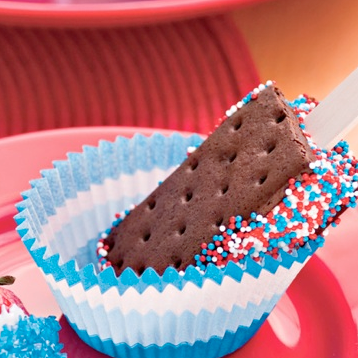 To keep mess to a minimum, serve the pops in festive cupcake liners. 1. Beat granulated sugar, butter, almond extract and egg in large bowl with electric mixer on medium speed for two minutes. Stir in flour. 2. Divide dough in half; cover half and set aside. Place remaining half on waxed paper or plastic wrap; press into 8-inch square. Sprinkle with one tablespoon each of the red sugar and blue sugar. Using waxed paper to lift, roll up dough. Repeat with remaining dough and colored sugars. Wrap rolls in plastic wrap and refrigerate about one hour until firm. 3. Heat oven to 375 degrees. Cut rolls into 1/4–inch slices. Place about two inches apart on ungreased cookie sheet. 4. Bake six to eight minutes or until edges begin to brown. Cool one minute; remove from cookie sheet to wire rack. 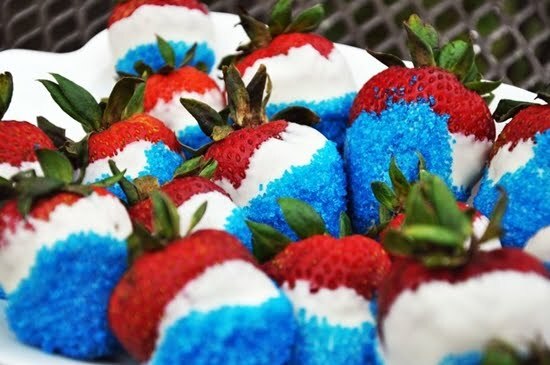 If you’re in a pinch this holiday, whip up one or all three of these red, white and blue desserts for an added touch to your 4th of July buffet. 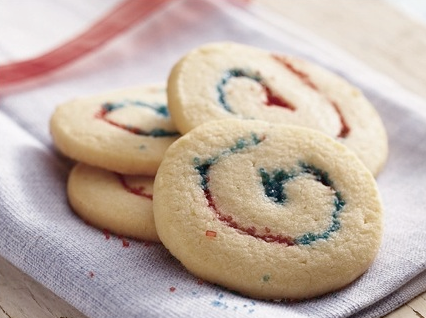 Sure to satisfy a wide array of palates, you can’t go wrong with these simple, fun and festive sweets!